The advent of mono-side meters, from Stages forward, has posed the problem of the truthfulness of the power data detected, or better estimated, by the system itself. As we know, Stages and other single-side meters (Garmin Vector 2S, bePro S etc.) take a leg (the one where the sensor is placed) and multiply the thrust value for two, assuming a parity between the two limbs % -50% that is actually far from being such, at least for the vast majority of cyclists, wandering around the entire wattage curve. The asymmetry between the two legs is in fact quite natural, both in the pros and amateurs, and also in well-documented scientific literature. The level of asymmetry is variable: in the chart below you see a very interesting example measured this week in the lab. This athlete, engaged in the incremental Vo2max test, corrects spontaneously with the increase in watts: first 62% -38% unbalanced on the right leg, arrives up to 49-51, so almost symmetrical, in the FTP / threshold zone. Asymmetry is in fact variable and depends primarily on the power delivered, then on cadence, fatigue level, and other factors such as biomechanical positioning. There is never a constant difference in the thrust between the legs, but varies with wattage pushed and in different periods of the race / workout. I think that along with the threshold test, that of pushing is one of the most useful to be done in this period, more so if you have meters that take one side (one leg, where the sensor is placed) and multiply it by two calculating the resulting watts. 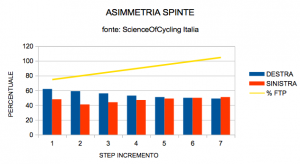 In the case of asymmetries pronounced and verified in the laboratory with sensors (scientifically validated ...), we also study specific work during the winter, aimed at filling the weak leg deficit, thus improving overall the efficiency of the pedal gesture.